The end of the season marks the end of an era for Langtoft Football Club as chairman Barry Woodthorpe has announced he is stepping down after 25 years service to the Vikings. Woodthorpe, who set up the club with close friend Brian Topham, who sadly died last year, has called an end to his role to spend more time with his family. In the last quarter of a century, he has overseen the Vikings’ rise from the lowest levels of Sunday league football to the Saturday Peterborough League’s top division. Woodthorpe has been involved in every aspect of running the club, whether it has been arranging fixtures, cleaning the changing rooms or putting the nets up. 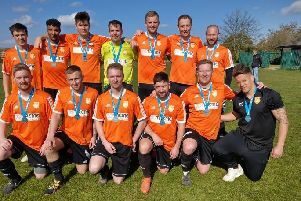 A year ago he wore the broadest grin in Langtoft for weeks after seeing the club secure its place in the Peterborough and District League’s Premier Division for the first time. Woodthorpe (61) and Topham started out as Vikings co-managers and, after early success in the Sunday league, switched to Saturday football with the long-term aim of reaching the top division. Woodthorpe said: “Brian retired from the club some years ago due to business and I took on the challenge on my own. “Thanks to some good managers, great people and players around me I achieved our wish, not just with the first team but with the reserves reaching Division One. Woodthorpe added: “I leave the club in great hands, with a good committee and new, good first team and reserve managers, who I believe could take the club to the next level. Langtoft United paid its own tribute to Woodthorpe on Twitter, describing his departure as a “huge loss”. The club added: “Every grassroots club needs a Barry Woodthorpe - the unsung heroes of local football whose tireless work is often unnoticed by the players. Langtoft resident John Mayoh will be the new Vikings chairman, with Leighton Atkin running the first team in 2015/16 and Ryan Hunnings overseeing the reserves. The club is also developing a junior section, under the Junior Vikings banner, with football sessions for three to 16 year olds throughout the summer at Manor Way, starting on 13 June.